Raleigh is not only the capital of North Carolina but is also the second largest city (next to Charlotte) in the state. It is known as the “City of Oaks” because the area has so many oak trees, which are evident when you go to the heart of Raleigh. It is mostly a part of Wake County since it has a small portion spreading to the county of Durham. Raleigh has nearby satellite towns and suburbs, including Carry, Garner, Clayton, and Holly Springs. It has a number of attractions for everyone, such as Marbles Kids Museum and the North Carolina Museum of Art. For sports fans, Raleigh is home to several sports teams, including the North Carolina State Wolfpack, Carolina Hurricanes, and the Carolina Mudcats. The city has received plenty of recognition from many organizations because of its high quality of business and life, including third place for the Best Place for Business and Careers in 2012 and the number one for Best Place to Live in America in 2011. For a home to be a great place to live in, it should be spotlessly clean. Homeowners and commercial buildings in Raleigh, NC that are in need of grout and tile cleaning services for their facilities can always turn to The Grout Medic. A Planned City with Grout Cleaning DemandsM. Raleigh is one of the oldest examples of a planned city in the United States. Right from its inception, everything was carefully designed. It used to be an undeveloped land that was chosen to become the capital of North Carolina in 1792 – less than 10 years after it was founded. The city enjoys a humid subtropical climate just like most of the southern part of the United States. Winters are usually short and cool but sometimes the nights can go above freezing temperatures. For many months, the city has a dry climate, and it can also be rainy between July and September. With the changes in weather and temperature, Raleigh homes and businesses that have tiles installed may retain more moisture than necessary. Sometimes, it can also be too uncomfortable for the residents to clean their grout and tile, especially during scorching days. As a result, they avoid the cleaning task. There is no need for you force yourself to perform the activity. We recommend that you leave the job to our professionals here at The Grout Medic. The Grout Medic specializes in tile and grout cleaning in Raleigh. If you see that your grout is discolored or stained, do not wait for problems to get worse. Pick up the phone and talk to our customer service representative so we can help you with such issues. Our experts are not only experienced in cleaning, but we also provide various home services for the restoration and beautification of your tile and grout in Raleigh. Some of our other services include grout color sealing, regrouting, recaulking, and water damage repair. The Grout Medic of Raleigh and Durham-Chapel Hill is proud of offer grout cleaning services, using proprietary products and environmentally friendly vapor technology. The Grout Medic deep-cleans grout with high heat, low pressure to remove dirt and grime, leaving it disinfected, fresh and renewed. 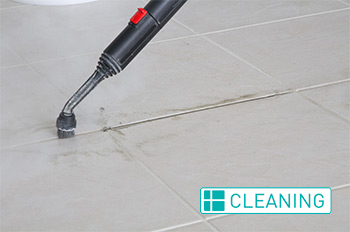 The Grout Medic’s grout cleaning services are done with green steam grout cleaning technology to provide a chemical-free process. Our grout cleaning services provide a safe alternative to chemical cleaners most homeowners use daily. Rid your grout of the dirt and grime that’s been embedded for years! Don’t let the look of your tile surface be ruined by discolored and dirty grout. By scheduling a grout cleaning appointment with The Grout Medic of Raleigh and Durham-Chapel Hill, you can make sure your grout stays clean and in great shape for years to come! Call the The Grout Medic of Raleigh and Durham-Chapel Hill, NC today at 919-357-3145 or fill out our quick Customer Info Form to get started right away! The best way to preserve the quality and appearance of your grout is through grout sealing services from The Grout Medic of Raleigh and Durham-Chapel Hill. We will apply our proprietary clear grout sealing material carefully to each line of grout. This sealant is designed to protect the porous grout from absorbing any dirt, preventing discoloration. The Grout Medic of Raleigh and Durham-Chapel Hill recommends grout sealing after every grout cleaning to ensure a long-lasting solution to grout discoloration every 2 years. Without grout sealing, you open the door for dirt, dust, and grime to enter back into the pores of the grout. At The Grout Medic of Raleigh and Durham-Chapel Hill, we are specialists in clear grout sealing. Get grout sealing services from The Grout Medic of Raleigh and Durham-Chapel Hill, NC. Call us at 919-357-3145 or fill out our quick Customer Info Form today! Color Sealing your grout helps to protect it and keep it looking great. The Grout Medic of Raleigh and Durham-Chapel Hill is proud to offer color sealing services for homeowners and business owners who want to improve the look of their home while also maintaining the integrity of their grout. By applying a color sealant or grout stain to the grout lines, The Grout Medic of Raleigh and Durham-Chapel Hill prevents the contamination of your grout from all the things that come in contact with it. Grout color sealing provides a watertight barrier for your grout, so you can worry less and have beautiful grout lines. The Grout Medic of Raleigh and Durham-Chapel Hill would love to help advise you on the right tone choices for your grout color sealing job. The Grout Medic of Raleigh and Durham-Chapel Hill, NC can clean and seal your grout right away, if you call us at 919-357-3145 or fill out our quick Customer Info Form! Discoloration also happens over time. When grout is left unsealed, it collects dirt, dust, grime, mold, and more materials in its microscopic pores. Even a simple spill on the floor can stain the grout for the long-term. The Grout Medic of Raleigh and Durham-Chapel Hill can clean most grout to like-new condition using our vapor technology, sometimes grout is stained so badly that there’s just no saving it and requires it to be regrouted. If your grout has become missing, discolored, or damaged, it’s time to have it removed and replaced by the experts at The Grout Medic of Raleigh and Durham-Chapel Hill. With regrouting services, or grout repair your tiled surface can look brand new again, without the hassle and expense of retiling. Regrouting services also provide health benefits, by getting rid of mold, dirt and mildew that’s built up over time. Instead of wasting time and money trying to re-tile the entire surface, regrouting services dramatically improve the appearance, almost as if you had replaced the tile altogether. Let the specialists at The Grout Medic of Raleigh and Durham-Chapel Hill remove and replace your grout. Call The Grout Medic of Raleigh and Durham-Chapel Hill, NC today at 919-357-3145 or fill out our quick Customer Info Form to get help right away! When old or poorly installed caulk begins to crack and peel, the result is an unsightly area that quickly begins to collect mold, mildew, and mineral deposits. With tub recaulking and shower recaulking services from The Grout Medic of Raleigh and Durham-Chapel Hill, you can get a fresh, clean look and the assurance that caulk has been expertly installed. This service protects your tub, sink, tile and countertops from grime buildup and damage. Recaulking is one of the simplest things you can do to update the look of your home while keeping your caulked surfaces in great shape. With recaulking services from The Grout Medic of Raleigh and Durham-Chapel Hill, you get a clean, fresh seal and protection from future damage, mold, and fungus growth. Mold can be dangerous to your health, so it is important to protect all areas of your home against this dangerous substance that collects around old caulk. If see black spots or cracks along the caulk in your kitchen, bathroom or anywhere in your home, call The Grout Medic of Raleigh and Durham-Chapel Hill. Recaulking not only protects your tile and fixtures, it will improve the dirty look of your home. Recaulking is simple and quick with The Grout Medic of Raleigh and Durham-Chapel Hill, NC. Call us today at 919-357-3145 or fill out our quick Customer Info Form. There’s a good chance you don’t need to completely retile to fix the problem of damage, loose or missing tiles if you have tiles or can find replacement tiles. The Grout Medic of Raleigh and Durham-Chapel Hill performs tile repair services. Our technicians can visit your home to recommend whether you’re a candidate for a simple tile repair or tile replacement. It’s smart to have the tiles replaced or reset. even the smallest cracks or chips in your tile could lead to a more severe problem in the future. The talented technicians at The Grout Medic of Raleigh and Durham-Chapel Hill will visit your home to evaluate your tile damage and recommend repairs. Whether you need tile repair or replacement, or grout repair or replacement due to tile damage, The Grout Medic of Raleigh and Durham-Chapel Hill can ensure a nearly flawless, attractive result. Call us at 919-357-3145 or fill out our quick Customer Info Form today! If you’re worried that loose, hollow, or missing tiles mean you must completely re-tile your floor or backsplash, take a step back and call The Grout Medic of Raleigh and Durham-Chapel Hill. Our skilled technicians can replace individual tiles or entire sections, saving you the time and expense associated with a complete tile remodeling job. To ensure high quality results, tile removal and replacement should be performed by a professional. The Grout Medic of Raleigh and Durham-Chapel Hill will visit your home to assess the damaged surface and determine the best course of action. We will replace cracked or chipped tiles, and place new tiles in bare spots, leaving you with a clean, elegant-looking surface. We will also make any necessary grout repairs to be sure that your tile surfaces are secure and stable for years to come. Tile replacement services also extend the lifespan of your floor and can serve to reduce future repairs. The Grout Medic of Raleigh and Durham-Chapel Hill can make your tiled surfaces look like new again at a fraction of the cost. Don’t put off tile replacement services so long that you’re forced to completely re-tile an area of your home. Call The Grout Medic of Raleigh and Durham-Chapel Hill for a free estimate. Get a free quote on tile replacement services from The Grout Medic of Raleigh and Durham-Chapel Hill, NC by calling us at 919-357-3145 or filling out our quick Customer Info Form! Tiled surfaces on tub and shower walls that have missing grout, cracked grout, or simple things like caulking along corner seams cracked or missing lead to water penetration behind the tile surfaces causing the wallboard behind the tile to get wet and damaged. The Grout Medic of Raleigh and Durham-Chapel Hill, our technicians can provide water damage repair for your shower or tub walls in your bathroom. 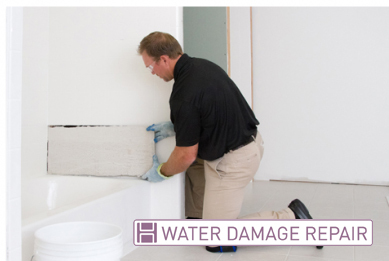 When water damage repairs are not addressed, the unattended areas may develop mold and mildew, causing a health risk for you and your family. Also, water damage causes other issues in the home like water spots on ceilings below and can most likely cause mold. Most people shouldn’t wait to have these areas fixed. The caring technicians at The Grout Medic of Raleigh and Durham-Chapel Hill will schedule a visit to your home as quickly as possible to assess the damage and begin work right away. • The Grout Medic of Raleigh and Durham-Chapel Hill removes water-damaged areas in showers of the home. • The Grout Medic of Raleigh and Durham-Chapel Hill can refinish the area to your specifications. Water damage in showers cannot wait! For the protection of your family and your home, have water damaged repaired immediately by The Grout Medic of Raleigh and Durham-Chapel Hill, NC. Call us at 919-357-3145 or fill out our quick Customer Info Form! The Grout Medic is the specialist to contact in Raleigh, including in the areas of the Research Triangle Park, Wake Forest, Eno Valley, and Shannon Plaza. Give our experts a call so we can learn more about your tile and grout problems and provide a solution. There are many benefits of contracting The Grout Medic for all your tile and grout cleaning needs in Raleigh. Whether you’re looking into buying, selling, or just trying spruce up your property, we can help you to make your tile and grout shine as it did the day it was first put in.